To create the impression of an image, the impressionist mosaicist arranges squares in a grid fashion one next to the other leaving the natural flaws and marbling in the tiles intact unlike traditional mosaics which rely on differently colored material arranged in arbitrary configuration to create an image. Using pre-cut stones that are similar in color and texture the resulting mosaics are almost too good to be true in comparison to the different traditional processes. The impressionist mosaic does not require grouting which allows every stone to keep its own identity. Impressionist mosaic is quite recent compared to the traditional mosaic; it started in 1990 with Roy Feinson who coined the term. 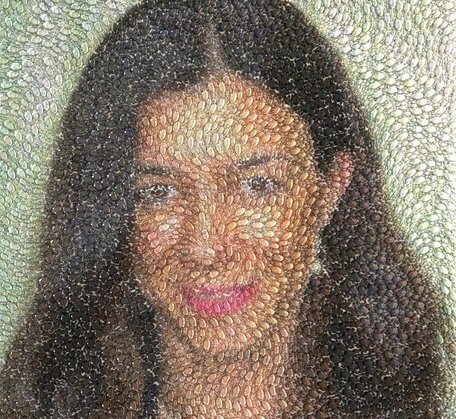 Later, in 2006, mosaic artists Nick Berg and Alan Roth made the technique commercially available in marble and wood and because of the higher image resolution, they coined the terms High Definition Mosaics and Photo-realistic Mosaics. The difference between impressionist mosaic and traditional mosaic is that the latter have a very long history dating back to at least the fourth century BC, employ different ways for their image creation and use small, colored materials to create a picture. Because the tiles can be cut into irregular shapes artists are able to come up with artwork that has high detail and color. In contrast, impressionist mosaic use standard sized tiles in colors arranged in squares. Each tile represents a pixel of the image. Which one do you prefer; traditional or impressionist mosaic?